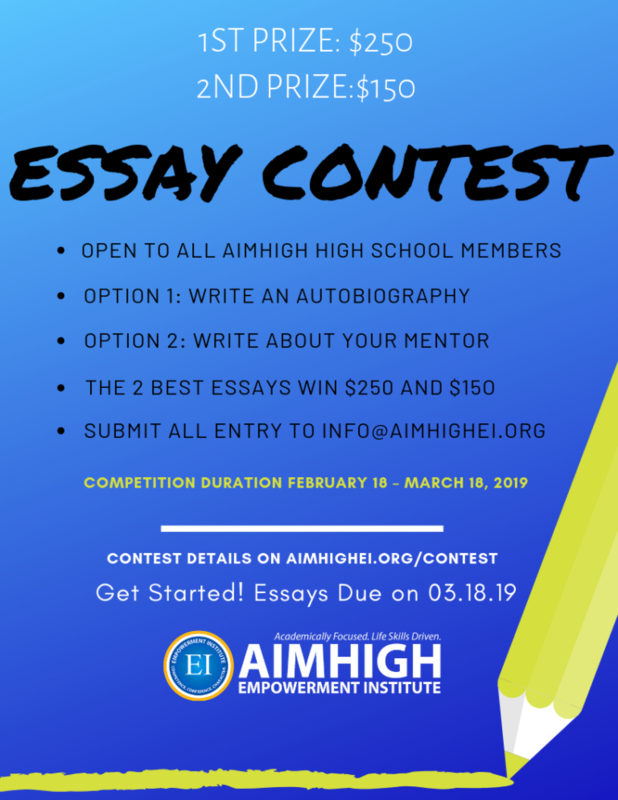 The AIMHigh essay writing competition is open to all high school student members of the AIMHigh Empowerment Institute. Students are asked to choose from one of the two options for submission of essay. Creativity and originality is strongly encouraged. Write an autobiographical essay telling your story. The essay should be totally about you, describing an event or action that has impacted your life. The essay could encompass your past and or present. Write an essay telling of a person in your life, dead or alive, whose life, words, or actions have shaped and impacted you significantly. Send your completed essay, in Word or PDF, as an attachment to info.aimhighei.org on or before March 1, 2018 at 11pm. The essay must be in English. Guidelines: Your essay should be between 750 and 1000 words. Essay should be original. Absolutely no plagiarism. Essay submitted after the deadline will not be considered. The winner will be informed by email on March 29, 2019. The winners for the competition will be officially announced at the Male and Female Empowerment Events in April. Prizes will also be given on this date. Winning essays will be published on AIMHigh website and Social media platforms.